Documentary. From a toddler's first lie to teenage fantasies, psychotherapist Philippa Perry explores the subject of childhood deception. Psychotherapist Philippa Perry delves into the world of childhood deception to discover when and why children lie. Are we all born liars? 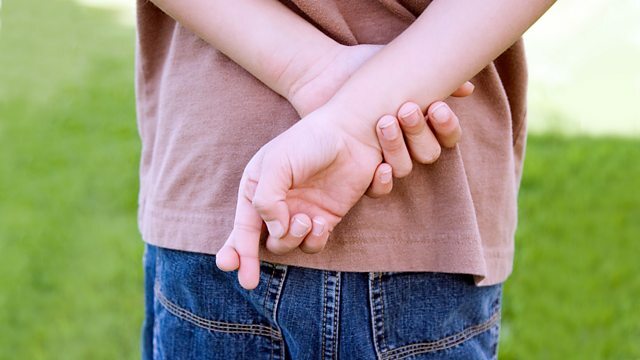 What role do parents and school play in developing our ability to lie? When and why can it become problem behaviour? Philippa speaks to author Ian Leslie who believes that a child's first lie is a cause for celebration. On the other hand, neuroscientist and philosopher Sam Harris deplores all types of lies - even tiny white ones - and tells his children the unvarnished truth about almost everything. Even at Christmas. We meet a group of excitable seven year olds who describe with great gusto their experiences of lying and being lied to. As Philippa observes, children receive very mixed messages from parents - on the one hand they're told not to lie but then they witness their parents lying all the time, often without even realising it. Similarly, she asks TV critic and mum Julia Raeside if television, particularly soaps, might be normalising lying. Philippa tracks down Margaret Connell, former headmistress of her daughter's secondary school, to discuss the life-changing advice about lying that Margaret gave to parents on the first day of term. Margaret believes that parents put too much weight on truth-telling and teenagers often feel pushed into an impossible situation. Students from Haringey Sixth Form College also explain why they feel it necessary to lie to teachers, parents and fellow classmates. We also hear about pioneering experiments by Dr Victoria Talwar of McGill University, Canada, which are increasing our understanding of how children develop their capacity to lie and the best ways for adults to foster their honesty.